Red bettas are produced when the normal red pigment has been increased in density and extended in distribution to cover the entire body and fins of the fish. 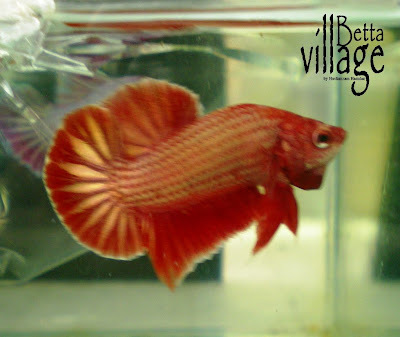 This mutant gene causes the betta to appear to be solid red in color. The Extended Red mutation is dominant over the gene for normal red color. In wild type bettas red is a layer of color that is just above the black layer. The only other colors that can cover red are the Iridescent blues and greens. The extended red gene in bettas is used to describe that gene which produces an abnormal amount of spread of red, non-red (and perhaps black) pigment on the betta, similar to the spread iridiocyte gene for the irridescent colors. However, as there are other factors that affect the physical appearance of the betta (such as the presence of the non-red gene which dictates that the betta show non-red in places where there would normally be red), a betta with the extended red gene may not even be red! There are also several other factors (amount of iridescence, amount of black pigment, intensity of color) which shape the ideal red betta. 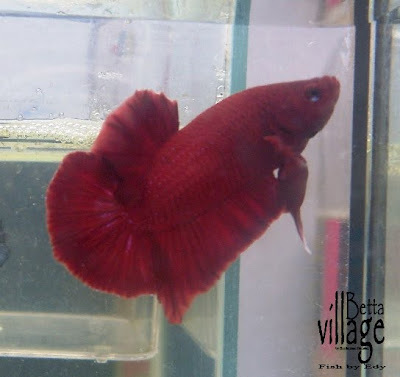 Hence, an extended red betta merely refers to a betta with the gene and is not sufficient to describe the ideal red betta. However, the ideal red betta should necessarily have the extended red gene. A breeder interested in pursuing ideal reds is confronted with two primary obstacles - ridding the fish of black edge and scales, and the tendency, in so doing, to reduce the intensity of the red coloration. Most breeders combat the black scale problem by introducing the cambodian gene into their line of extended reds. While this does serve to eliminate the black, it also pales the body color of the fish. A greater success can often be achieved by using the blonde gene, which preserves the blood-red color but usually will not eliminate all of the black. Theoretically, it is possible to remove the black from all extended red lines, either by increasing the spread of the red to cover all of the black layers, or by removing the black layer entirely. The first theory is based on the proposition that the traditional cambodian is caused by not one gene, but two. The first would be a simple Mendelian that removes black pigment on all parts of the fish except the eyes; the second is a non-Mendelian gene that determines the spread of red on the fish. In the traditional cambodian, this gene exhibits itself as red only on the fins of the fish. The Perfect Red should also carry no iridescence. This can be a tricky problem, because many breeders, wanting to improve the finnage of their red line, have outcrossed to the Power Fin iridescent colors and bred the red back from there. Logically then, the next step would be to eliminate the presense of iridiocytes from the red line, and this can be achieved in a number of different ways. The first (and most obvious) method would be to outcross the line to a red line with less iridesence. Another good way to go is to cross the line onto a good yellow (non red), preferably one that carries extended red and no cambodian. Another breeder I know has succeeded in creating a line of reds with near-perfect coloration by outcrossing them onto orange. Reds can be especially frustrating because of their tendency to display a white or clear edge to their fins, most commonly the caudal. Happily, this pale outermost edge often fills in as the fish matures. But in some cases it remains, leaving the breeder clenching his teeth and fighting the urge to trim off the offending portion of the fin with a pair of blunt-nosed scissors. Reds can also present a problem in the spawning tank, as they are more prone to outright displays of violent aggression (kind of like redheaded people!). It can be nerve-wracking watching the pair of would-be lovers cheerfully shredding each other's fins, but it seems to be par for the course with reds. When you finally do get them spawned you are left with a bunch of feisty Irish bairns who will start sparring with each other much sooner than other colors, necessitating early jarring. The red color can be late to appear as well. Usually it starts with red streaks in the fins, until the fins are completely covered and the fish looks like a traditional cambodian. Then the body begins to redden, and I've found that the ones that begin reddening earliest end up with the most intense end color. Others will look like they are going to remain cambodian or turn into yellows, but then suddenly start coloring up. These are the ones that have the most satiny shade of red, but it is usually lighter than the 'ideal', and is usually indicative of the cambodian gene at work.